We are a neuro rehabilitation center focused on delivering measurable recoveries. Cerebral palsy (CP) is a group of movement disorders that appear in early childhood. Signs and symptoms often include poor coordination, stiff muscles, weak muscles and tremors. There may be problems with sensation, vision, hearing, swallowing and speaking. TRAINM’s goal for CP management is to maximise the person’s independence and community engagement through a multidisciplinary and individualised approach. A stroke is a condition in which poor blood flow to the brain results in cell death. There are two main types of stroke: ischemic, due to lack of blood flow, and hemorrhagic, due to bleeding. TRAINM’s goal for stroke rehabilitation is to return patients to normal life as much as possible by regaining and relearning the skills of everyday living. Multiple sclerosis (MS) is a demyelinating disease in which the myelin in the brain and spinal cord is damaged. MS takes several forms, with new symptoms either occurring in isolated attacks (relapsing forms) or building up over time (progressive forms). TRAINM’s goal for the rehabilitation therapies of MS patients is to return function after an attack and prevent disability. It also aims to prevent secondary complications. The treatments are intense, effective and have no adverse side-effects. 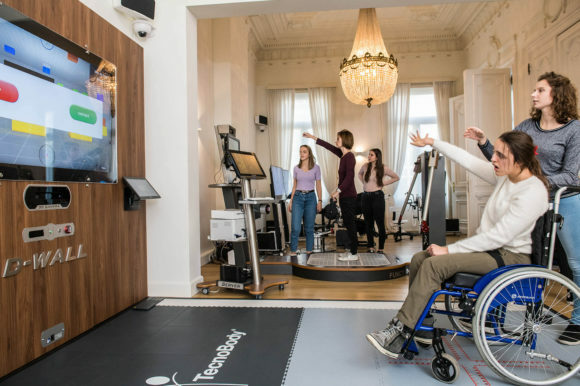 The gym offers highly skilled therapists and is equipped with the newest technologies comprising 3D cameras, sensors and VR for improved training and rehabilitation. I also try to use it in everyday life, which I didn’t do before. We’ve already tried lots of therapies all ultimately with very little success, now we have the feeling that we’re seeing a bit more progress. Before I started her and walked from my bedroom to the bathroom with my frame I was exhausted, now I can walk a distance of 200 meters without being exhausted. This therapy is much more intensive and you see more result. My hand is working better, the spastic movements are reduced I have a lot more function. The difference with the other treatments is that it worked stabilizing and with the Lokomat I am getting better which you didn’t expected with MS. What for me is like comfort is that I can again turn around in bed. When I came here for my first time I couldn’t do much with my hand and now I can till a stick. Would you like to see the possibilities for yourself at one of our Info Sessions?